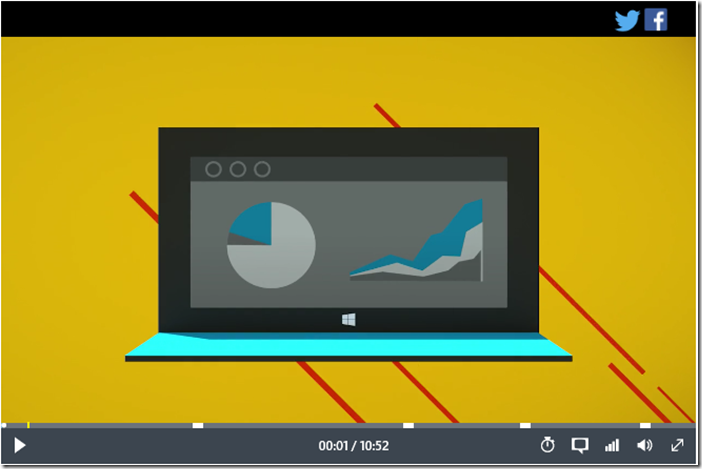 Azure Media Player (AMP) has come a long way since its initial release at NAB last year. Out of the box, the player provides a wide range of functionality for the cross-platform playback of Azure Media Services streams but we’ve also received a lot of great feedback and suggestions for player enhancements. As you could imagine, with the increase in AMP usage around the world, there’s been an incredible number of feature requests and as a result, we thought it pertinent to provide some guidance on how to extend the player to support these requests and build a community around AMP users to share their extensions in the form of plugins. As a member of the community, you can use existing AMP plugins or build your own to share and collaborate with others. Plugins can help reach key scenarios that fit your business needs which could range from playing a playlist of videos to sharing your videos on social media, or even viewing stats with player analytics. Plugins are as creative as you are, so the sky’s the limit! When a plugin looks like it would benefit the entire AMP community, we work with the plugin creator(s) to integrate their enhancement directly into the product, so that the entire user base can enjoy it. This collaborative system plays a significant role in helping Azure Media Player improve your business. Check out our plugin gallery to start using existing plugins today! We've also added a new section to our documentation providing guidance on building and sharing plugins. This can be achieved through a simple plugin that overlays a Twitter or Facebook icon on the video. Upon click, the viewer is shown a pre-written "status"" or "Tweet" template with a link to your video. By clicking publish, everyone in their social network now has a link to your content. You can create all kinds of plugins to change AMP’s functionality, appearance, or connect with other services; so if you ever feel like AMP is missing out on some form or feature, you can write a plugin for it. Some plugins have already been integrated with the current AMP release. These are key examples of features that were originally developed as plugins but were recognized to be additional functionality that others could benefit from so we integrated them directly into our source code. The new plugin gallery has several plugins that the community has already contributed for features like time-line markers, zoom, playlists, analytics and more! These are free for you to use and modify right now. The more contributions that are added to the gallery, the more the community grows. The gallery provides source code for plugins that you can incorporate into your application and includes instructions on how to do so as well as a demo reference for you to see the plugin in action. To build your plugin, check out our documentation for a full list of API's and events. Add new features, add or remove buttons, change colors, or integrate with other products. Once you have created something cool, be sure to submit it to our plugin gallery so others can use it too! Your plugin should be ready to go, it’s as simple as that! Created or modified an awesome plugin that you want to share in the plugin gallery? You can submit your plugin for inclusion in the plugin gallery by clicking the submit button in the gallery and filling out he email template. If you’re up for the challenge or have any questions, let us know and we’ll be happy to help you ramp up.